Standing on the Giza Plateau outside of Cairo, Egypt stands a modern marvel for its time, the Great Pyramid. For 3800 years it stood alone as the tallest man-made structures on the planet. The Egyptians don’t build pyramids anymore and haven’t for over 4500 years. At night they shine lights on the monuments as a testament to the great civilization that they once were – and so we have our own monuments to great achievements of how great our civilization can be, our rockets to the moon. After reaching the unreachable, we canceled the program and let our monuments rot. A few years ago, before the Saturn V in Huntsville was restored, I was shocked on a visit there to find the Saturn V laying on its side, on the grass, and rotting. It was faded, the metal eaten in parts, overtaken by rodents, birds and other animals that made it their home. Now, the Saturn V is restored and sits in a museum where like the pyramids future generations can come and say “what great people these must have been”. 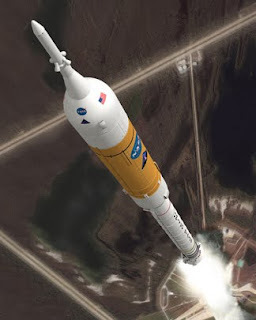 The space race began because a unique set of circumstance occurred to give birth to it, and along the way those events kept happening, at first they made the race more exciting, but after the race was won, the events turned against the program. Manned spaceflight has been misunderstood since its beginning. We put a lot of national treasure into reaching the moon, but we never saw it as an investment. Like Steinbrenner and his Yankees, we just thought, how much will it cost to win, and just do it. When we had won, we looked at space in a new light. Having never established it as an investment in our future and in our technology – we saw it as an expense. An investment is something you put money into and get a greater value back. If space exploration were sold as a good investment with a guaranteed return, funding it would have never been a problem, but that wasn’t done. Instead, we viewed space exploration as a necessary evil – if we have to do it, then spend as little as possible. As so it floundered. So many people have failed the space program. Strategy mistake after mistake. Political wrangling, waning public support, a lack of creativity and vision for the future. Everyone has some accountability for the state of where the U.S. Manned Space Program is today. As I read the reports on Obama’s latest proposal, one Congressman remarked “if we're not going to do it right, then why do it at all”. So it has come to this. The people and not just the few fervent supporters must step up and say they want America to be leaders in space. For without that we will fail. Every four years NASA comes under the gun, every change in Administration threatens a new direction. Our world has changed too. In the 60’s, the space program WAS the technology. We used typewriters, and had three tv channels to watch and most shows were in black and white. No CDs, DVDs, Cable, Cell Phones, Computers, iPods,Email, or Internet. The space program marveled us like nothing else could. Today, technology is so pervasive that not being able to reach the moon seems nonsensical. We can do so much and we did that in the 60’s – it has to be easier now. Couple that with movies that look so real footage from the Mars or the Moon would disappoint. It’s much harder to dazzle the public’s fancy with space when movies can take them there without leaving their living rooms. “The World is Flat” as Thomas Friedman says and I’d bet on a global alliance to develop a Mars mission before I see the U.S. going it alone. I hope we will adequately fund the space program, but I’m skeptical. Who will stand up and speak for NASA? For now, we seem content to live off our past laurels. I don’t want my future grandkids and their children to go to the space center, and like the pyramids marvel at our monuments and wonder - who were these people that did such bold and great things? Mike, After reading many articles and reviews of the new NASA budget, I have been convinced that our President knows what he's doing. I look forward to watching as this plays out over the next 3 yers. With a successful year for SpaceX, we could be right back up to LEO by 2011.